No need to splurge on designer make-up. When we know something's going to make us look and feel gorgeous for half the price or less we HAVE to share it. Beauty junkies, you're in for a real treat - here are our top ten beauty buys and theyre 'll under £10! Whoever said value make up was a waste of time is very wrong. You just need to know what you're buying into. How do you do that? You come to us. From Bourjois' Healthy range to L'Oréal's True Match collection there's a beauty steal in here you'll love. 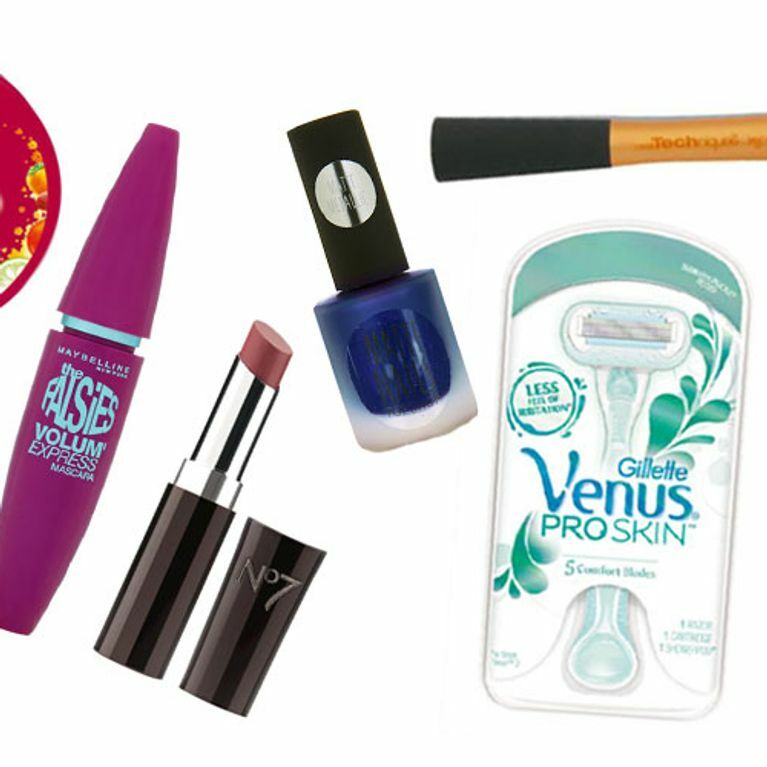 Here are 10 drugstore favourites you need in your beauty arsenal, stat. Ladies, this foundation is a drugstore must-have. With great coverage, blendability and a gorgeous, satiny finish you'll never look at another foundation again. It's known as a good dupe for Armani Luminous Silk too so what more can you ask for? For a stunning dewey look mix it with your favourite moisturiser. We love. Buy the foundation for £8.49 at Feelunique.com. Clearasil Daily Clear Superfruits Refreshing Pads help clear your skin for under a fiver! These refreshing beauts contain salicylic acid to help gently cleanse and exfoliate the skin. And with a blend of raspberry and cranberry extracts, you can't really go wrong when it comes to giving your skin a nice antioxidant boost. Buy this product for £4.07 at Boots. We all feel a little bit nostalgic when slathering on cocoa butter, no? Well we have to admit it, we are completely and utterly obsessed with this moisturiser. The luxurious cocoa scent, the buttery texture, the pump, the vitamin E - you can't get much better than that. No wonder it's the UK's #1 Cocoa Butter Body Lotion. Buy a bottle for only £5.89 at Boots. You won't regret it. The Asian inspired, Bourjois Healthy range is all and all amazing but if we had to pick one it has to be the Compact Powder. The matte powder is perfect for finishing, boosting and refreshing your make-up on the go. And no more rummaging through your bags ladies, it also comes with a handy mirror! P.S. It smells gorgeous. Buy your own for only £8.99 at Boots. We're a little bit in love with these lipsticks. No7's Stay Perfect Lipstick is great for nights when you don't have a lot of time to constantly reapply. And even better, it helps keep your lips moisturised, rich in colour and striking all night long. Available in both matte and satin finishes. Buy your favourite shade for only £9.95 or get matched made at your nearest No 7 counter to find the best lipstick colours that work perfectly with your skin tone. Wing out your lashes with Maybelline New York's Falsies Volum' Express. It's probably the most raved about drugstore mascara, ever, and well, for good reason! No flaking, crumbling and it lasts all day long. It's won our hearts. Get your own pair of buildable falsies for only £7.99 at Feelunique.com. It's the best tenner we've ever spent. Nowadays pampering products are hard to come by when you're looking for value and quality but this mask ticks all our boxes, especially if you're prone to breakouts. Super Facialist's Anti Blemish Clay Mask gives pores a good clean using salicylic acid to help exfoliate and unclog pores while dead sea mud, avocado oil and acacia honey work to help nourish and rebalance skin. We love it to death. Buy your own tube for only £8.99 at Boots. Beauty isn't just limited to make-up and skincare products. Looking and feeling good also comes right down to basics, a good clean shave. If you want something that's guaranteed to make your skin feel silky smooth, then sod the disposable razors - get yourself a Venus ProSkin Sensitive. Whether you're sensitive or not you can be assured that this 5-bladed beauty will help protect your skin and give you a great shave every single time. Get your razor for only £6.66 at Boots. Oh, how we love Boots. The fastest growing make-up brushes In. The. World. And it's no surprise when you look at the price and see the results for yourself! The whole Real Techniques range is amazing, but the foundation brush is unbeatable. It's great for buffing, blending and it's super easy to clean. If you want an airbrushed finish this is the brush to go for. Thank you, Samantha and Nicola! Buy it now for only £9.99 at Boots. Bargain. When it comes to dark, damp, dreary weather (ahem, UK weather) nothing picks-you-up like a bit of added glam. So why not achieve that with your nails? We've been a long standing fan of Topshop polishes, one because they're long-lasting and two because they're amazing value! Their new collection of matte metallic nails is perfect for autumn and winter - see for yourself. Pick up your fave shade for only £6.00 at Topshop.com. What are your all-time favourite beauty buys? Tweet us @sofeminineUK! The Kim Kardashian PRP Vampire Facial: Is It Really As Scary As It Seems?